Gold prices plunged this week on more concerns about the global economy. Click the chart for more on gold and other commodities. NEW YORK (CNNMoney) -- Gold prices continued to plunge Friday, despite the market turmoil that often drives investors to the traditional safe haven. Gold tumbled $101.90, or 5.9%, in regular trading to $1,639.80 an ounce. 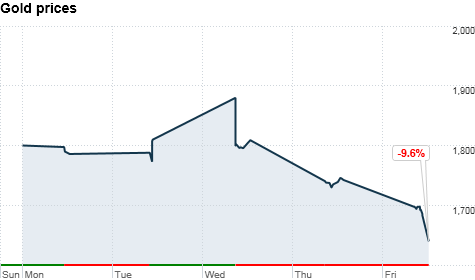 It's the second straight day of steep declines for the precious metal. According to the Chicago Mercantile Exchange, Friday marked the first $100 daily price drop since Jan. 22, 1980, when gold plunged $143.50 to $682 the day after having spiked to a record high. Keith Springer, president of Springer Financial Advisors, said that while gold has benefited from economic uncertainty in recent months and years, it's primarily been a hedge against inflation. But the growing worries about a global economic slowdown have raised new fears that there could be a period of deflation, or falling prices, in the months ahead. "People are quickly coming to the realization that gold does very bad in a deflationary environment," he said. Gold isn't the only commodity to be hit by concerns about the global economy. Silver suffered its worst trading day in decades losing $6.48, or 17.7%, to close at $30.10. Copper and platinum also both lost nearly 6%. But those metals have far more industrial uses than gold, Springer said, so fears of a recession should drive down those prices.